I suddenly remembered a pot of Panang Nuea that I made last week. There's a portion in the freezer still. Curries freeze very well, as long as the liquid level is high enough to cover up all the meat, so I often have a portion or two on hand. 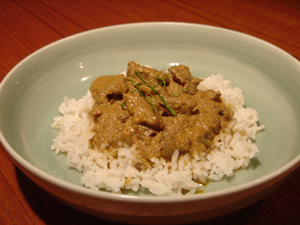 Panang Nuea, a type of red curry with beef, was one of my grandfather's favorite dishes. It is one of only a handful of Thai curries that are supposed to be slightly sweet. Well, you probably didn't know that, since most Thai curries outside of Thailand are mostly too sweet. At my grandfather’s house, where I grew up, we often had it for lunch. I have vivid memories of those lazy days sitting at table with my beloved grandfather on the wide, covered patio that ran the length of the house. It was a breezy space under the shadow of two giant mango trees, so it remained cool even on the hottest days of summer. Grandfather, khunta as I called him in Thai, took most of his lunches there. Panang Nuea was a staple at those lunches, though it was served in a manner that was slightly different. At khunta’s house, we usually ate Panang with bread instead of rice. Not just any bread, but white sandwich bread, their crust trimmed, toasted to a crisp perfection, and cut into dainty triangles. There was also often a type of salad to accompany the curry, something slightly tangy and not so spicy, as the curry wasn’t so spicy either, perhaps something like the Yum Polmai that I wrote about here on the blog a while back. To end the meal, we would each have a small bowl of Loy Gaew, a dessert soup with pieces of lychee, rambutan, or longan floating in icy syrup perfumed with jasmine buds, to cool off not only our body but our palate after the meal. Can you see now where I got my food obsession? The Panang was always made by my eldest aunt Chawiwan, from my grandmother’s recipe. My aunt and I cooked it together the last time I was in Thailand, and I’ve made it myself a few times since. The curry is robust, with tender slices of flavorful beef in a thick curry that was more a sauce than a soup, redolent of lemongrass, lime leaves, and other herbs and spices. I know that that home, the one I shared so happily with my grandfather, doesn’t exist anymore, but a mouthful of this leftover curry, reheated and served simply on top of steamed rice (no sandwich bread around today), I was transported back to those carefree days, sitting at table with my beloved grandfather, slowly savoring the delicious Panang. Closing my eyes, I could feel the warm breeze on my face, there was again the scent of jasmine in the air, and even with the eyes still firmly shut I could see the bright rays of sunlight shivering down through the foliage of the old mango trees. Happiness is but a taste away. 1 can of coconut milk, about 14 fl.oz or 400 g.
3. let cook at a very low simmer for about an hour or two, or until the liquid reduces by about half into a thick sauce, or until the beef is melting soft, check the seasonings, add more fish sauce or palm sugar as needed. 4. serve with steamed jasmine rice or crispy toasts. Pound everything in a mortar, or just use your blender and be done with it. Further instruction on pounding curry paste was previously published here: On the Pounding of Curry Paste. You could use store bought curry paste, it will be just fine, but if you do so, throw in a few 2-inch pieces of lemongrass (smashed a little) and a handful of lime leaves into the pot with the rest of the ingredients too. The canned paste will appreciate that little added kick. Be sure to fish them all out before serving.